That's what we can call a Firebird! That is a bad place to put a gas cap. 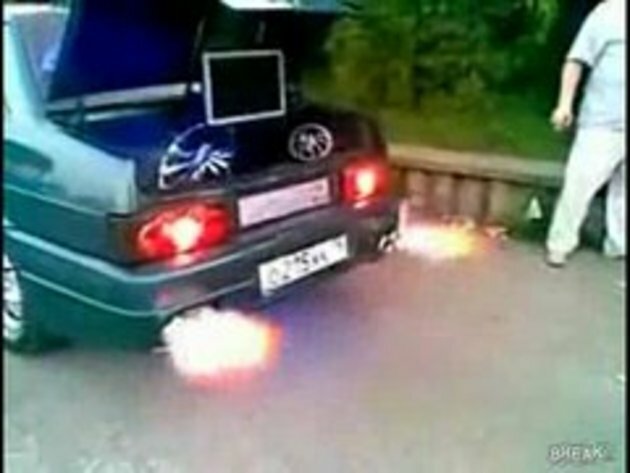 all that money spent on a lada and the guy still can't afford a decent video camera!!! Is that your vision of a east europe ? If yes you are nothing but a ignorant shallow person. Yeah, they weren't pouring alcohol, they were pouring water and juice over it, but when gasoline catches on fire, you can't extinguish it with water, only with sand or fire extinguisher. #6 are you serious? where i come from people are a lot more "chill". stereotypes are still done, but on a subconscious level. That was so easy to put out ...just take your damn shirt off and hit it !!! damn stupid brain dead people ! The right tool for the job!!! HELLO FIRE EXTINGUISHER!! 2:26, You can see a very big fake smile. He wasn't happy that that happend when they filmed it..
WHO WOULD PIMP A LADA?! The fact that I get -9 for my comment proves only 1 thing: People on Snotr are ignorant fucks who would degrade other nation with their unfounded comments basing just on stereotypes. #18 But they are nice stereotypes to capture on video... and by the way, just have a look for all those stereotypical American videos where the comments say 'stupid Americans' (and the like). That's gold, too bad it looked like it had a metal fuel filler cap! stupid $h!ts with an ugly @$$ car. haha. such a waste of money. Ping it up probably cost more than the caritself.